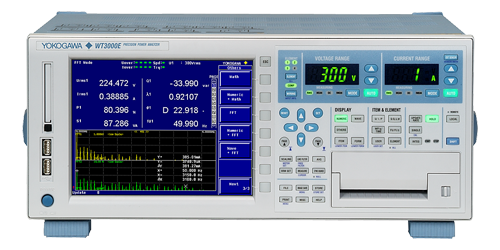 The WT3000E can be used to perform harmonic measurements in compliance with EN61000-3-2 Ed. 2.2. Note that this capability requires the /G6 option. Yokogawa also release a very useful software application. The WT3000E is useful for evaluating harmonics in equipment such as aircraft, in which the fundamental frequency changes to harmonics. Note that this capability requires the /G6 option. The WT3000E can also be used to observe changes in the harmonic distortion factor in each phase. Note that this capability requires the /G6 option. The WT3000E can determine the phase angle formed between the voltage fundamental wave of input element 2 or 3, and the voltage fundamental wave of input element 1. It can also determine the phase angle formed between the current fundamental wave of input element 1, 2 or 3, and the voltage fundamental wave of input element 1. Note that this capability requires /G5 or /G6 option.